Glass beads tell a story relating to diverse cultures and societies. More than the expression of a desire for ornamentation, beads have historically served a functional purpose as well. Beads played an important role in burial ceremonies. Bodies in Egyptian burial chambers were discovered adorned with nets of stone and faience beads. Beads were regarded as ritualized objects, the colours, patterns, the way they are worn as well as the placement in the burial site, have meaning. The eye bead, used to repel the “evil eye”, is a common one throughout history. The Egyptian stratified bead, where layers of glass form the image of an eye; Roman face beads and the Islamic eye motifs, are all intended to safeguard the wearer during the transition from life into the afterlife. Beads are a visual representation of wealth, status and power. In ancient societies, glass beads signify wealth and power. An African chief may display a rare, imported Venetian chevron bead to signify his status and value in his culture. The volume of beads worn and how rare a bead is tells us a story about that individuals wealth. The Nigerian Yoruba kings wear head to toe elaborate beadwork garments and accessories, claiming their status and position. In many cultures, articles of clothing will be adorned with beads that signify a change or transition in that persons’ life. In American Indian and Indonesian cultures, baby carriers have beautiful bead motifs specific to aid, protect and comfort the child. Beaded elephant masks found in Cameroon are worn to inspire wonder during celebrations and ritualistic events. Beads have been critical to the expansion of global exploration and exchange, and have inspired a wave of popular imitation beads. Indo-Pacific glass beads, first produced in India as early as 200 BC, are some of the most traded beads throughout history, being actively traded for over 1000 years are travelling as far as China and West Africa. Glass European trade beads have inspired imitation beads to be sold for profit, which is interesting when you consider a part of the original purpose of producing glass beads was to imitate precious stones, gems, and other natural materials. 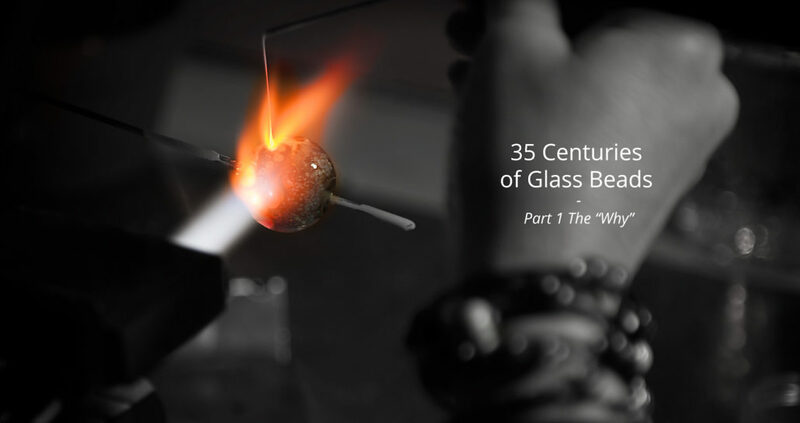 Glass beads may have their origins in history, but they continue to evolve and take on new meanings as they find a home in different cultures across the globe.